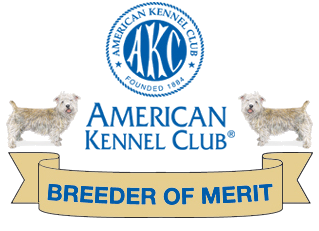 The AKC Standard calls for a shoulder height of 12-1/2 to 14 inches. Glens can be shorter and occasionally taller. Glens typically weigh 35 to 45 pounds, so you can imagine what a muscular, heavy-boned breed this is, with its big head and broad chest. It has a long body, short legs and an oddly rising topline. Its front legs are bowed with its front feet turning out. Its tail is docked at half length. This allows a safe handle for pulling a working Glen out of a hole, as well as a rapid, rat-a-tat-a-tat wag from a happy Glen. 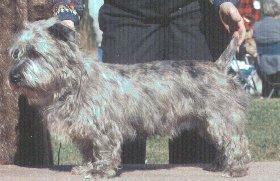 Its colors are wheaten (from a light wheaten to a reddish shade), and blue-brindle (from light silvery-blues to very dark). It is a shaggy, double-coated dog which essentially does not shed. Therefore a Glen should be stripped two to three times a year to remove the "dead" hairs, neaten the coat and reduce any tendancy toward matting. Some people with allergies to dogs can tolerate Glens, but other allergic people develop a reaction that may intensify until the person eventually must give the Glen up. It is best for an allergic person to expose him or herself thoroughly to a Glen before making an ownership commitment. Glens do not have a strong "doggie odor."